Marry in haste, repent at leisure…. Assigned convicts in Port Phillip might only have had to attend one muster every New Year’s Day, but they were still convicts. This was reinforced by the regulations involving marriage. For now, the Port Phillip Gazette, along with the people of Port Phillip had to wait until the case reached its final conclusion in January. The Hay and Corn market, situated in Flinders and Swanston-streets, was established for the disposal of hay, corn, fodder, straw, grass, grain and pulses. The Cattle Market, intended ultimately to be erected and opened for the sale of horned cattle, sheep, horses, pigs, goats, mules and asses; would for some time be held at the place known as the Auction Company’s yards which were leased for 6 months for the purpose. The Port Phillip Patriot reported the discovery of another infant’s body the next day, making a total of seven children buried clandestinely during the previous two years. Was it infanticide? Or poverty? died by the visitation of God, to wit, of congenital hydrocephalus and not by any violent means whatsoever to the knowledge of the said jurors. These jurors, too, criticized the way that the baby’s body had been interred. Still, at a time when there was no compulsory registration of births and deaths (which didn’t occur until 1853- there’s a fascinating podcast by Madonna Grehan about the implemention of the Births, Deaths and Marriages Registration Act of 1853 here) , and with no lying-in hospitals (or any hospitals for that matter at this stage, except for one for convicts) then it would be very possible for children to be born and die without a documentary trace. The Port Phillip Herald of 17/12/41 noted that the Ward Chipman had recorded 21 deaths, 19 of them children from dysentery brought on by the change of diet and want of nourishment consequent on the long detention of the immigrants in Bristol. I can only imagine the recrimination and sorrow among the families on that ship. On Tuesday 21st December Captain Cole held a picnic at Brighton. Obviously the ladies and gentlemen of Port Phillip were already in holiday mode on a Tuesday. A splendid fete champetre was given on Tuesday last by Captain Cole of Melbourne, to nearly one hundred and fifty ladies and gentlemen. Nothing could exceed the style in which it was got up; it is the first of a series of fetes to be given during the present season the fashionables of Melbourne. Actually, it was just as well Georgiana didn’t go- a week later she gave birth to a baby girl. At a time when so many people were arriving – both immigrants and self-funded arrivals- it was no doubt fitting to give advice on how to cope with Melbourne’s weather. It’s rather amusing to see that obviously workingmen coped better with the heat, even though ladies, children and “parties who could escape from business for a couple of hours” benefited from a siesta. I let slip last week that Governor Gipps was to visit the Port Phillip District in October 1841. There had been hints and rumours but now it had been confirmed: Governor Gipps was to visit for the first time. He hadn’t been to Port Phillip, but he had already met the superintendent Charles La Trobe, who stayed with him in Sydney before coming down to Port Phillip. The warmth of their relationship is reflected in the Gipps-La Trobe Correspondence, edited by A.G.L. Shaw. The newspapers didn’t know whether to gush with excitement or to continue with their ongoing litany of complaint about the Governor and New South Wales generally. i.e “we provide all the money through land sales and they give us nothing back”; “why doesn’t Sydney give us more for infrastructure?” etc (not unlike the State Premiers in Australia today, come to think of it). In the end the glamour of vice-regal ceremony won out and whole columns were devoted to the visit. Reading through the Police Court columns, it comes as a jolt to realize just how draconian the N.S.W. “Act for the better regulation of Servants, Labourers, and Workpeople”(1828) legislation was, even exceeding the English Masters and Servants legislation on which it was based.Not just content with dismissal, employers could (and did) take their employees to court where they could be imprisoned, sentenced to hard labour or fined. And so we read in October 1841 of Captain Smyth of Heidelberg taking his servant Ruth Robinson before the court for gross misconduct in what Smyth clearly intended as an exemplary punishment. I haven’t been able to locate any information about the Hired Servants’ Act, but it seems to have restrained Captain Smyth somewhat – although the punishment was still harsh when servants’ wages were about £15 per annum. HIRED SERVANTS. Ruth Robinson, a hired servant in the employ of Captain Smyth, of Heidelberg, was charged with the following gross misconduct. The previous day she wished to leave his service, when Captain Smyth said he would go to Town, and when suited with another servant, she was at liberty. During his absence the conduct of the woman Robinson towards Mrs Smyth was most abominable. She gave her mistress to understand that, the master being absent, she should not obey orders. Upon being requested to bring in the dinner, she said that she would not, until she had dressed herself, then she would bring in the dinner, after which it was her intention to walk into Town; and as she said, so she acted. The woman also had put herself into so violent a passion that Mrs Smyth had reason to fear personal violence. Captain Smyth said, that he brought the woman before the Bench upon public grounds; here were a number of females coming to the colony, honest and well behaved no doubt, but totally ignorant of their duties as servants; when they had obtained the necessary degree of knowledge, they became insolent, and endeavoured by every means in their power to obtain their discharge. They were however particularly cautious not to commit themselves before their master, fearing that he might appear against them, but taking advantage of his absence abused their mistress, well knowing the objection of ladies to come into a public Court. He hoped the Bench would make such an example of this woman as to deter others from offending in like manner. The Bench regretted that under the 10th section of the Hired Servants’ Act, they were forbidden to imprison females for misconduct in their hired services. By the 8th section of the same act they were empowered to inflict a fine, and sentenced her to pay the penalty of £5; if not paid in a fortnight her goods would be levied upon. She was ordered to return to Captain Smyth’s house, and deliver to Mrs Smyth what articles had been placed in her charge. Winds mostly strong; a gale on 12th, weather frequently cloudy, threatening rain at times but none fell. Top temperature for the week was 70; lowest 45. 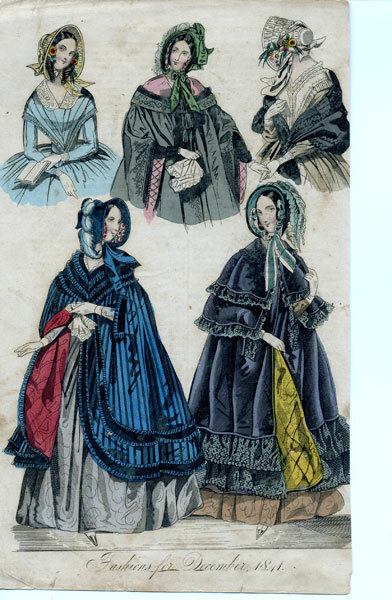 Here’s a heads-up for the new fashions for December 1841, taken from the New Monthly Belle Assemblee and reproduced in the Port Phillip Herald of 22 April 1842. Of course, the news was already outdated by the time magazines reached Port Phillip, although I guess that it was fortuitous that descriptions of winter fashion (if indeed there was such a thing) reached Melbourne as it was moving its its own, much milder winter. I’m not sure how the fashion described in a magazine like the New Monthly related to the clothes that people actually wore. I think of the catwalk fashion that we see from the major designer houses todayand it seems to bear little resemblance to ‘real’ clothes that ordinary people wear. As you can see- I am no expert on fashion at all- not then, not now! London Public Promenade Dress- Violet satin robe; a high corsage, tight to the shape, trimmed with three rows of cord and tassels to correspond; a single row is continued down the centre of the skirt. Long tight sleeve, ornamented from the elbow to the wrist with a succession of knots to correspond. Drawn bonnet, of deep orange-coloured satin; the brim edged with a ruche of dark green ribbon, and the interior and exterior trimmed with flowers. Embroidered muslin collar. Grey velvet scarf, bordered with sable fur. Sable muff. Demi-Toilette. Pink pou de soie [sic- should be peau de soie] robe; corsage en gerbe, and long tight sleeve. White satin chapeau, a round open brim; the interior trimmed with small pink flowers; the exterior with a torsade of white satin ribbon, and a bouquet formed of the tops of white curled ostrich feathers. Green velvet mantelet; it is of a large size, sits close up to the throat, with a falling collar, trimmed with green fringe of a light pattern; a heart lappel, edged with fringe, forms it to the shape of the bust; it falls low behind, descends in front in long and very full scarf ends, and is bordered with fringe. The promenade dress sounds very colourful, with deep orange, violet and dark green. I’m finding it hard to shake the image of a rainbow lorikeet. I’m not sure if the picture below relates to the description or not. It apparently came from the New Monthly magazine, but I’m finding it hard to match the illustration with the description. (I think it embiggens if you click on it). Now here’s a way to decide which book to read next- what goes well with your decor? 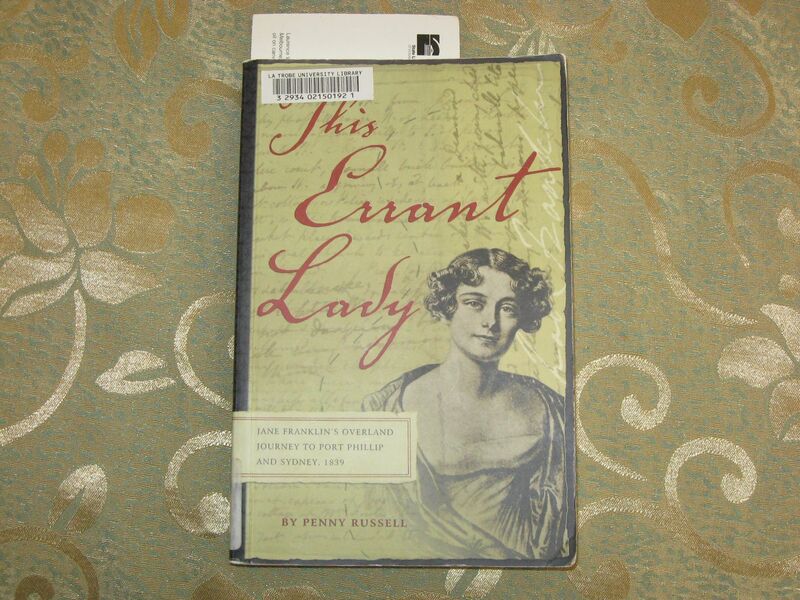 It gave me great pleasure to see Penny Russell’s This Errant Lady lying on my bed, matching so well with my doona cover! Martha Stewart, eat your heart out! I was drawn to read this after finishing Ken McGoogan’s Lady Franklin’s Revenge recently. I’d forgotten that Jane Franklin visited Port Phillip and Sydney in 1839 and I was interested to see what she said about Port Phillip in particular, even though Judge Willis, the Resident Judge of Port Phillip had not arrived at this stage. I’ve been writing a chapter the last few weeks on Judge Willis’ involvement in colonial politics, which has taken me back to his relationships with Sydney colonists, and as a member of the government elite (albeit of a neighbouring colony), Jane Franklin was well-placed to comment on political events and personalities in Sydney. This utilitarian approach can be partly explained by the fiction by which her trip was justified, both to her husband and to Tasmanians generally- that it was a research trip into a sister-colony that would be of use to her husband Sir John Franklin, Governor of Van Diemen’s Land, and would be a form of diplomatic representation of VDL at a governor-to-governor level. The reality was that she was restless and curious and liked nothing better than getting away from her husband and the scrutiny of a small colonial society. Mind you, she liked her comforts too- the iron bedstead came on this trip, just as it did on all her journeys. But she revels in ‘roughing it’ and escaping amongst people who were only vaguely aware of who she was, and you sense the increasing tightening of protocol and deference as she moves from the outlying areas into the more settled districts surrounding Sydney. Russell has also worked hard, though, to preserve the human aspects of Jane Franklin’s interactions with the people she met. Her trip was a long one- from April to July 1839- and she was quite devious in her excuses to cut it short as Sir John wished her to do. But she probably should have come home earlier: it was quite clear by July that she had outstayed her welcome with the Gipps’, and it is her discomfort at this knowledge that makes her more likeable. We have the intimacy of her coming into Mrs Gipps’ bedroom for a chat, thinking that she was alone, and finding Governor Gipps stretched out on the bed; we have the cringing, walking-on-eggshells embarrassment when Gipps was furious that she had allowed his carriage to become soaked while she was using it. For me- and I admit that this is probably an acquired taste- I enjoyed finding characters from “my” Port Phillip and Sydney strolling onto the stage. So we meet Mr Verner (who was to become Judge Willis’ good friend and neighbour) bowling along in his carriage with two friends; there’s a ship with Protector Robinson’s Van Diemen’s Land aborigines on board (some of whom were to be sentenced to death by Judge Willis two years later); Captain Lonsdale (who was to become one of Judge Willis’ targets) taking them to a corroboree but arriving late so that it was all over by the time they arrived; there’s Chief Justice Dowling and his wife, and Justice Alfred Stephen (Judge Willis’ brother judges with whom he was anything but ‘brotherly’). In fact- and this is important for my purposes- conspicuously absent is Judge Willis and his good lady from the balls and levees and receptions that were laid out for Lady Jane Franklin. And so, eventually Jane headed for home. What a trip that was! As with all journeys, once you’ve decided that yes, you’re ready to go home, it seemed to take an age. But in this case it did- five weeks from leaving the heads to their arrival back in Hobart (a trip that can take about 3-4 days for the Sydney to Hobart yacht race today). Buffeted by storms, and with food and water supplies running low, their ship bobbed around; once almost glimpsing the coast of Tasmania before being swept out into the seas again over towards New Zealand. Relieved, no doubt to be back, you still sense Hobart society swallowing her up again, with criticisms of her recklessness in even embarking on the trip and sniffy comments about petticoat government. An intrepid traveller, Jane Franklin was consumed by an unquenchable curiosity. She looked, questioned, listened and wrote- pages and pages of minuscule notes on every topic that came to hand. 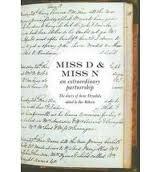 This edition, carefully abridged and introduced by Penny Russell, makes the diary available for the first time to general readers. And while it’s probably not exactly a ripping yarn, we general readers (and more specialized ones too) should be glad that she has.